Things have moved so fast. Student Teaching has been good this week. Full responsibility is hard. I never imagined how difficult teaching is. Papers, classroom management, lesson plans, observations, papers, way too much. I am really going to have to work out my logistics in my own classroom. So the plan for Haiti, is to leave first thing in the morning. Fly to Miami, spend the night, then fly into Port Au Prince Saturday. We are really looking forward to doing whatever is needed. It looks like we will be working some construction projects. You can follow the Joy House blog at http://haitijoyhouse.blogspot.com/. Joy House is the mission we will be working with. They are updating the blog every couple of days, so you can see what we are up to there. I probably will not have access to the internet there, so my updates will have to be after we return next Saturday. Anyway, I better get pack to my late packing. I am going to Haiti over Spring Break. More information to follow. Life is very busy at the moment. I even have the sink resting in place (sans plumbing, that is today's project). Honestly I am quite excited about it. It is really good learning and knowing that I can do more than just take things apart. Now I know that I can put them back together again, to some degree at least. Lately I have been working on the house and schoolwork. I have to get the school work done this week. So that is primary focus for now. A few weeks ago, I did do my first big job on the sawmill. I was able to log and cut up a big cedar that had fallen/broken down. A bit of a project and a learning experience at that. But it went very well. I loved it. I am so looking forward to getting this house done, so that I can mill more often. I am really noticing lately how time flies when you stay busy. I feel like I have finally hit some kind of groove, which is a good thing. I am learning how to work well on my own for once. It still usually takes some kind of pressure, or deadline, or motivation, but I am gaining some confidence in my abilities. Take the house for instance. I hired out the leveling of it, because I did not want to mess with it. I thought they would be faster, etc. Well, turns out I was having to supervise the crew 50% of the time anyway, so I could have hired my own guys and did it myself. It made me start to think how I want stuff done, and then just do it. Figure stuff out on my own. So this past week I have been doing that. The house now has a partial bathroom floor, toilet installed, and hopefully a kitchen floor by the end of today. I sidetracked and replaced the landmark mailbox of 2808. Yes, the sunflower mailbox is gone. And in its place a new sleek mailbox mounted on a custom cut, cedar post. The first practical use off the sawmill. I was excited. I took a mini-vacation over Memorial day with friends to Austin, and came away with a portrait, forever etched into a tree. Forever at least until some guy with a sawmill comes and cuts it down for lumber. Thanks, Pedro. Pleasant surprise finding out about your talents. Seven big pieces, and two trailer loads I figured to be about 11,000 lbs. of wood. 2800 board feet. Now I just have to figure out how to get them on the mill! Well, things coming up - finishing the house, bathroom and kitchen immediately then exterior siding, finishing/catching up on schoolwork, finding a job, milling wood. There is also a group of us getting together to avoid debt. Whether that is eliminating current debt, or saving up to pay for school or house. It should be very exciting. I know I am. The potential is staggering. Anyway, got to get to work. 50% chance of rain today. He was such a good baby. No crying just after being born. Apparently he has a single dimple, just like me. I am the only one that has one until now. It has been a busy month plus... I was able to finish my student teaching/observation at Bryan High. It went very well. I was pleased with the teacher I got to work under, and thoroughly enjoyed working with the kids. It was mostly seniors I worked with, and also did some substitute teaching. Now I just have to get caught up on all the paperwork. Here is my newest experiment, my sawmill. I was able to pick it up, but have had limited time put into it so far. I am so looking forward to getting the house done and finding a job, so I can put more time into it. So far I have gotten new blades for it, and have run it through a couple of logs. So far so good. 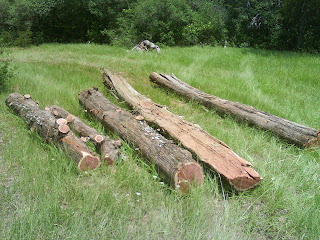 I cannot wait to go through a big mesquite and cedar log. Here is the kitchen floor I opened up a couple of weeks ago. a bee suit. A lovely nest of bees took up residence in the addon's ceiling which we could not get to, so I get to frame a wall of a house in a bee suit. It was totally worth the $100, because I have yet to get stung. So here the wall is framed. ... And done. The wall went very well. I just wish the small finish work inside could go so well. I guess there is always tomorrow. Back in town. NOT driving back and forth to Louisiana anymore. The big news is that I have quit my job in order to pursue teaching. So now I will be able to focus on getting my teaching certification, finish my house, and finally become a true citizen of Bryan/College Station. I am so excited. First order of business is passing my content exam for High School History this coming Monday. Second on that front is my student teaching for 4 weeks in April and May. Third is finding a job for the fall after finishing my online work. Becoming a student again after 9 years may be interesting as well. The house has started being torn apart, (obviously, from previous posts). 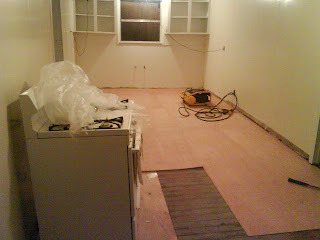 I need to remove my floors next, and then start leveling. It will be a project. But it must be done. The fun thing I hope to have as an income hobby is my newest purchase of a sawmill. I have been cutting some mesquite and cedar in the last few months, and cannot wait to see how they mill up into lumber.